Over the weekend, my husband and I were browsing around a great little antiques store and discovered a semi-complete, musty-smelling hardcover set of The Hardy Boys adventures, from a 1960s printing (here's a list of all the titles). I was delighted, especially since I didn’t have to lug the 30-pound box of mystery novels out to the car myself. I had a total crush on the Hardy Boys as a kid. I mean, what’s not to love? Frank and Joe Hardy are handsome, impeccably dressed (neatly-pressed slacks, collared shirts, and ties), and drive their own motorcycles (safely). They have a vintage motorboat, the Sleuth. They’re brave, polite, helpful to their father, respectful to their mother, and never swear (the closest they come to using bad language is when they utter quaint exclamations like “Good night!” and “Why, the cheap so-and-so!”). They seem delighted to attend “Bayport High School" and do their homework, and their chief ambition in life (aside from running their own detective agency like their father does) is to attend university when they graduate. They have pretty but rather two-dimensional girlfriends, who are patient and understanding (when they get left in a cloud of dust as the boys roar off on their motorcycles to investigate another crime, which is often). They have a “band of brothers” in town: young men who are all similarly talented, athletic, and own motorcycles, speed boats, and hot rods, and who are always ready to jump into another adventure and help the Hardy Boys catch the bad guys. Their mother, Mrs. Laura Hardy, has nerves of steel. She is the utter opposite of the modern “helicopter” parent…the word “overprotective” is not even in her vocabulary. As her sons (and husband Fenton) get themselves threatened, kidnapped, shot at, knocked unconscious, attacked by wolves, and so on, she continues to smile placidly throughout the entire original series. That’s a long time to keep it together and still say brightly, “Be safe, dear!” knowing full well that they [probably] won’t be safe at all. And there ends my new collection of old Hardy Boys mysteries, but of course Grosset & Dunlap continued the series through 1979, after which point the thread of the story was continued by other publishers through 2005. A word about the author, as promised: Franklin W. Dixon did a whole lot of writing, for being…nobody! Many different (real) authors wrote under the pen name “Franklin W. Dixon,” among them the Canadian author Leslie McFarlane, who wrote 22 of The Hardy Boys mysteries. According to Mr. McFarlane’s daughter, he regarded the books as just a way to pay the bills (he made roughly $85 per book during the Depression, to support his family). Said his daughter, "They'd give him an outline, but to make it palatable, he'd come up with different characters and add color and use large words, and inject his wonderful sense of humour [sic]. And then he'd finish and say, 'I will never write another juvenile book.' But then the bills would pile up and he'd start another." 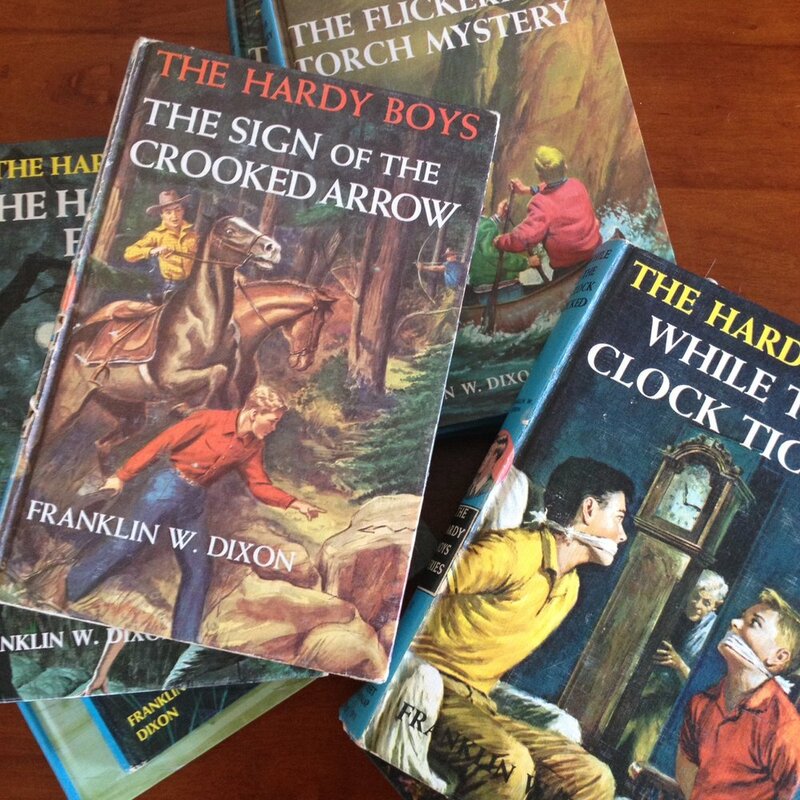 The Hardy Boys series will wet your appetite for action, adventure, and good, old-fashioned cooking!